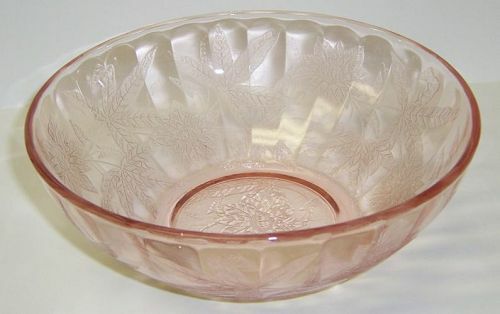 This pretty pink Floral Poinsettia Oval Platter was made by Jeannette Glass from 1931 to 1935. This Platter measures 10 5/8 inches X 7 3/4 inches. It is in very good condition with no chips, cracks or scratches. Be sure to search our other Floral available. We guarantee all items to be as described. THANK YOU. 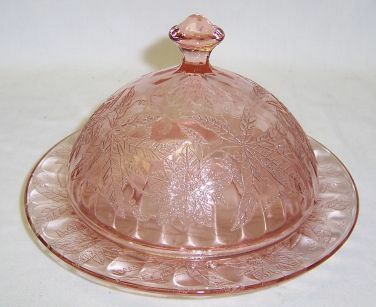 This pretty pink Floral Poinsettia depression glass Butter Dish with Cover was made by Jeannette Glass from 1931 to 1935. Both the Butter bottom and cover are in very good condition with no chips, cracks or scratches. Be sure to search our other Floral available. We guarantee items to be as described. THANK YOU. This pretty pink Floral Poinsettia depression glass Cup and Saucer Set was made by Jeannette Glass from 1931 to 1935. Both the Cup and Saucer are in very good condition with no chips or cracks. Be sure to search our other Floral available. We guarantee all items to be as described. THANK YOU. 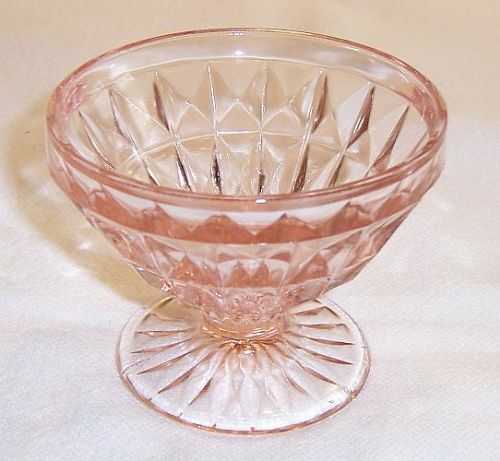 This pretty pink Homespun aka Fine Rib depression glass 4 1/2 inch diameter, closed handle, Berry Bowl was made by Jeannette Glass from 1939 to 1940. This Berry Bowl is in very good condition with no chips or cracks. We guarantee all items to be as described. Feel free to email any questions. THANK YOU. 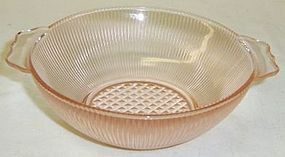 This pretty pink Sierra Pinwheel depression glass Oval Platter was made by Jeannette Glass from 1931 to 1933. This Platter measures 11 inches wide X 8 inches across and is in very good condition with no chips, cracks or scratches. Be sure to search our other Sierra available. We guarantee all items to be as described. Feel free to email with any questions. THANK YOU. 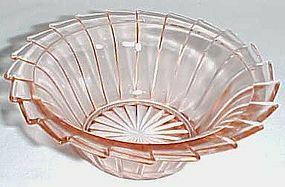 This pretty pink Sierra Pinwheel depression glass 5 1/2 inch Cereal Bowl was made by Jeannette Glass from 1931 to 1933. The Cereal Bowl is 1 3/4 inches high and is in very good condition with no chips or cracks. Be sure to search our other Sierra available. We guarantee all items to be as described. Feel free to email with any questions. THANK YOU. 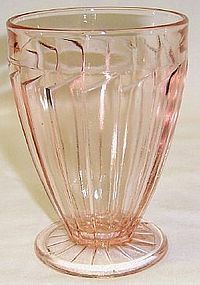 This pretty pink Sierra Pinwheel depression glass 4 1/2 Inch Footed Tumbler was made by Jeannette Glass from 1931 to 1933. The Tumbler holds 9 Ounces and is in very good condition with no chips, cracks or scratches. Be sure to search our other Sierra available. We guarantee all items to be as described. Feel free to email with any questions. THANK YOU. 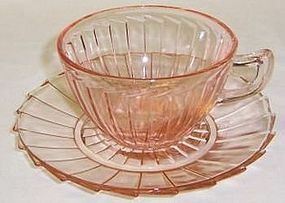 This pretty pink Sierra Pinwheel depression glass Cup and Saucer were made by Jeannette Glass from 1931 to 1933. The Cup measures 3 1/2 Inches in diameter. The Saucer measures 5 1/2 Inches in diameter. 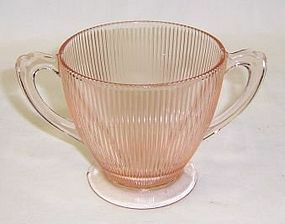 Both the Cup and Saucer are in very good condition with no chips, cracks or scratches. Be sure to search our other Sierra available. We guarantee all items to be as described. Feel free to email with any questions. THANK YOU. 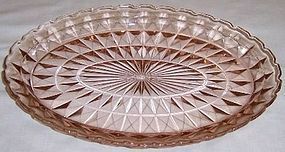 This pretty pink Windsor Diamond depression glass Handled Plate or Tray was made by Jeannette Glass from 1932 to 1946. This Plate measures 10 1/4 inches inside the handles X 12 1/2 inches outside the handles. It is in very good condition with no chips or cracks. Be sure to search our other Windsor available. We guarantee all items to be as described. THANK YOU. 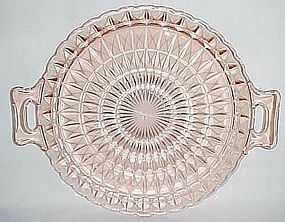 This pretty pink Windsor Diamond depression glass 11 1/2 Inch Oval Platter was made by Jeannette Glass from 1932 to 1946. This Platter is in very good condition with no chips, cracks or scratches. Be sure to search our other Windsor available. We guarantee all items to be as described. THANK YOU. 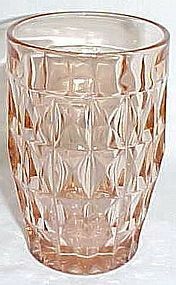 This pretty pink Windsor Diamond depression glass 4 Inch 9 Ounce Water Tumbler was made by Jeannette Glass from 1932 to 1946. It is in very good condition with no chips or cracks. Be sure to search our other Windsor available. We guarantee all items to be as described. THANK YOU. 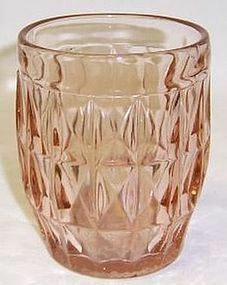 This pretty pink Windsor Diamond depression glass 5 Inch 12 Ounce Ice Tea Tumbler was made by Jeannette Glass from 1936 to 1946. This Tumbler is in very good condition with no chips or cracks. Be sure to search our other Windsor Diamond available. We guarantee all items to be as described. THANK YOU.